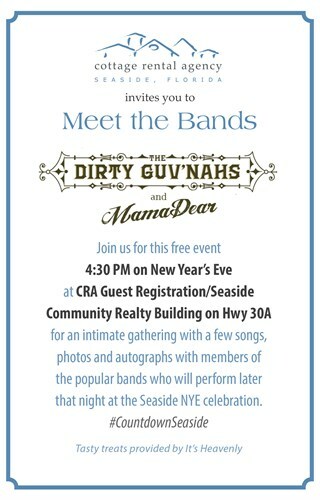 Cottage Rental Agency, the premier provider of Seaside, Florida vacation rentals, is hosting MEET THE BANDS, a free event held at 4:30 PM on Wednesday, December 31, 2014 at the CRA Guest Registration/Seaside Community Realty Building located on Hwy 30A in Seaside. 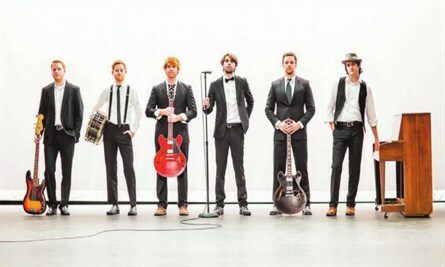 The free event is open to the public and features members of Tennessee bands The Dirty Guv’nahs and MamaDear, who will provide the entertainment for the town of Seaside’s New Year’s Eve celebration later that night. 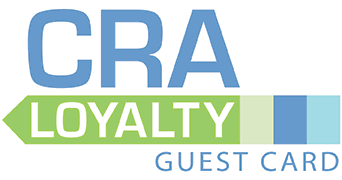 During the Meet the Bands event, the artists will play a few songs, sign autographs and let fans take photos in an informal setting on the patio at the Seaside Community Realty and CRA Guest Registration building. Seaside merchant, It’s Heavenly, will provide sweet treats to welcome all who attend this event. The premier provider of Seaside, Florida, rentals for more than 30 years, Cottage Rental Agency (CRA) offers the best beach homes along Scenic Highway 30A and largest selection in Seaside. For information, visit http://CottageRentalAgency.com. The Dirty Guv’nahs, a six-piece brotherhood from Knoxville, Tennessee, is called “a fiercely soulful band” by the Boston Globe, and has been affirmed by Paste Magazine to “know rock and roll from the inside out.” No strangers to Seaside, FL, the Guvs will be joined by Nashville group MamaDear as the opening act. The trio of young singer/songwriters known collectively as MamaDear is creating a buzz and amassing fans up and down the east coast with their well-crafted original songs, exuberant stage show and sterling harmonies.